… I bought a couple home to mess with them to see if I could get them to look more real for the beach house (since big real plants that renters have to water and/or would die in the off-season seems too high maintenance) and DUDE, it’s the jackpot. Put them in a bigger pot. I used cheap white Ikea planters I already had on hand. Once they’re in a larger pot it solves the proportion issue at the base, and it also makes them look lusher and leafier on the bottom, instead of seeing the weird stem down there (plus it hides the fake dirt). Bend & twist their stems & leaves to look more full. Straight from the store they’re super squished and not as believable, but you can adjust them into a more natural shape, which really makes a difference. Bask in the glory of them not being neon green in your house. 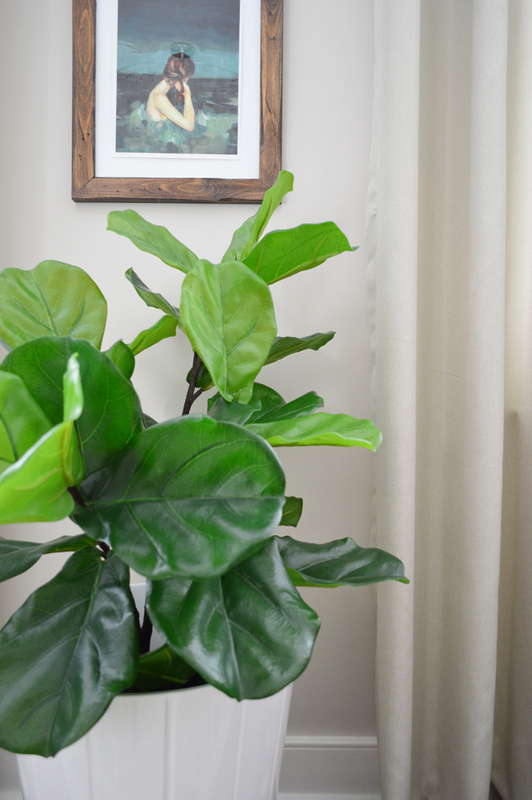 Target’s super bright fluorescent lighting isn’t doing these guys any favors, but once at home when I put them right next to my real fiddle leaf figs the color is nearly identical. Real ones have brighter green leaves at the end (newer growth is brighter) which is one of the things that makes these such good fakes – they have those brighter end leaves too. Although the white planters I used are from Ikea (so cheap!) the little wheely plant stands are something we like to add to the bottom of ours (they’re much easier to rotate/move/etc that way). Also, here are our curtains, our rug, our swimming lady print, and cloudy landscape print for anyone wondering. 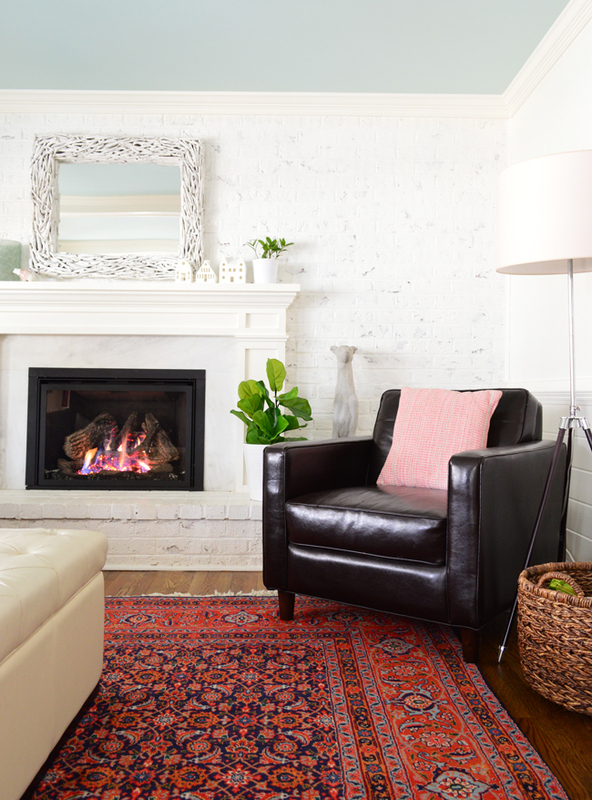 And a smaller one that works on a fireplace mantel or on a tabletop or in the corner of a smaller space like a bathroom. But unless you plan on putting a real & a fake one side-by-side in your house for some reason, my verdict is that they’re pretty dang believable. 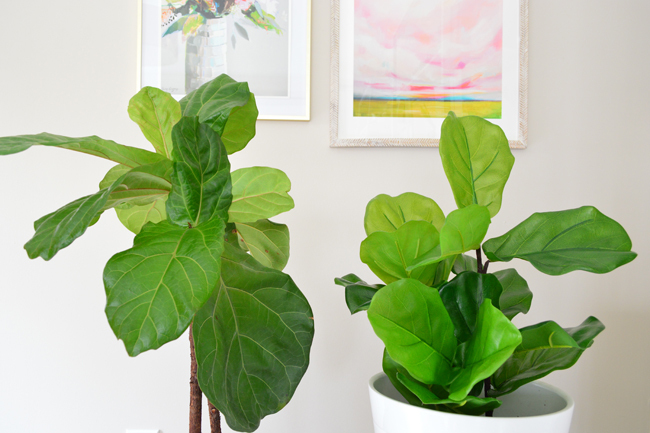 Fiddle leaf figs are a good plant to mimic because the real ones have super waxy leaves – so glossy plastic leaves actually look a lot like their real leaves. I’ve tricked more than a few people with mine so far… and we’ve only had them a week. 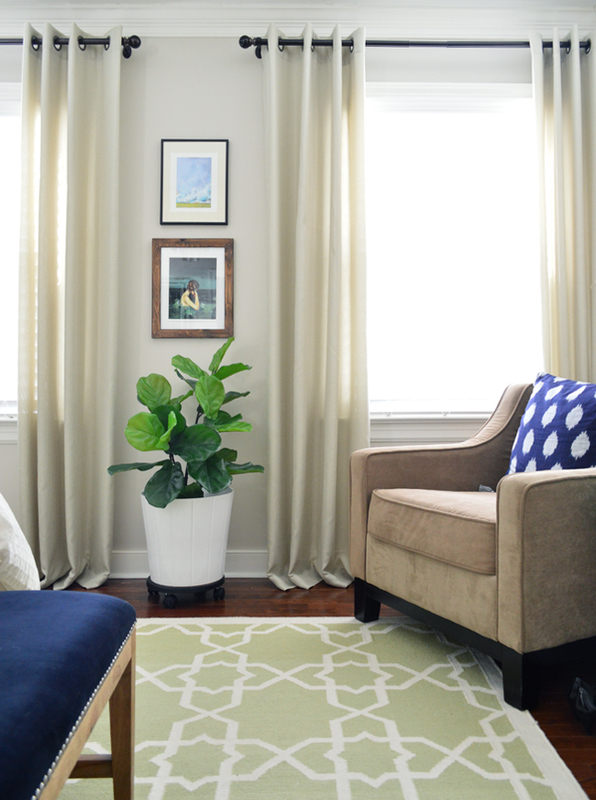 So if you have a room that gets a lot of light and could support a real fiddle leaf fig, and you can keep a real one alive (read more on how I do that here) – go for it! But if you don’t have a room full of light (they don’t work well in medium or low sun) or you just keep murdering innocent plants… these are the next best thing I’ve found in 5+ years of peering quizzically at all of the options. 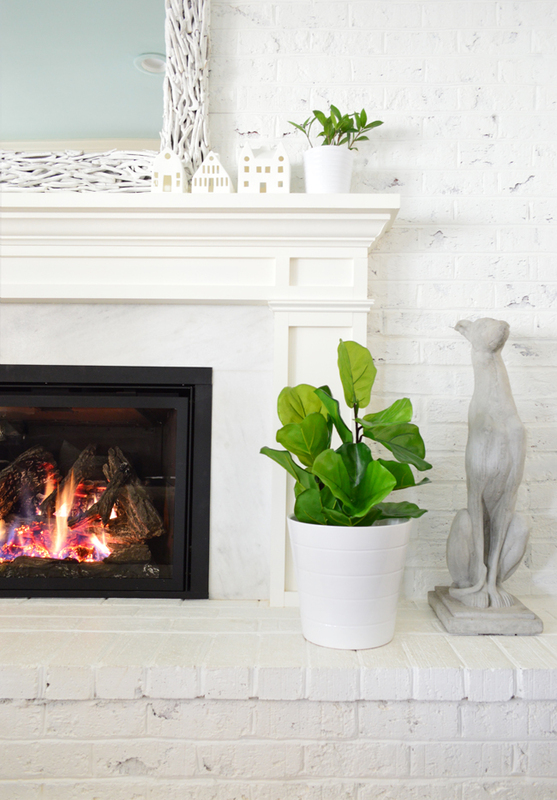 And although they’re not cheap, they are a pretty good deal as far as large fake plants go (this one from Williams Sonoma is $225 and this one from Wayfair is $135). Plus, a real one of this size might cost $69+, so the largest Target fake one for $99 might be worth the fact that it won’t ever keel over on ya. 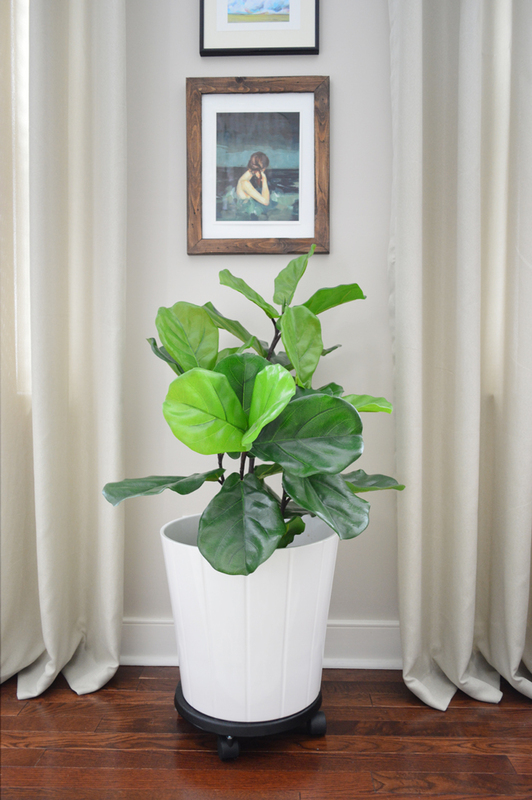 So yes, I bought five of them (two big ones and three small ones) because I’m hoarding three for the beach house in case they stop selling them (and I’m using two of them in rooms here that won’t support real fiddle leaf figs). Fake it ’til you make it, baby. Or ’til forever if your room is dark or your thumb is black. Whatever works. Oh, and if you can’t find them in the store (I had to hit a couple Targets to build my collection because they’re selling so fast) you can get free shipping on them online because both the bigger one and the smaller one are over $25. There’s really not any risk because you can just bring them back to your local Tar-jay if they arrive and you can’t make ’em work. Which is why I also just ordered ten bathing suits from them online (so I don’t have to see my pasty legs under those fluorescent fitting room lights and can hopefully find one I don’t hate). And yes, they’re all black.